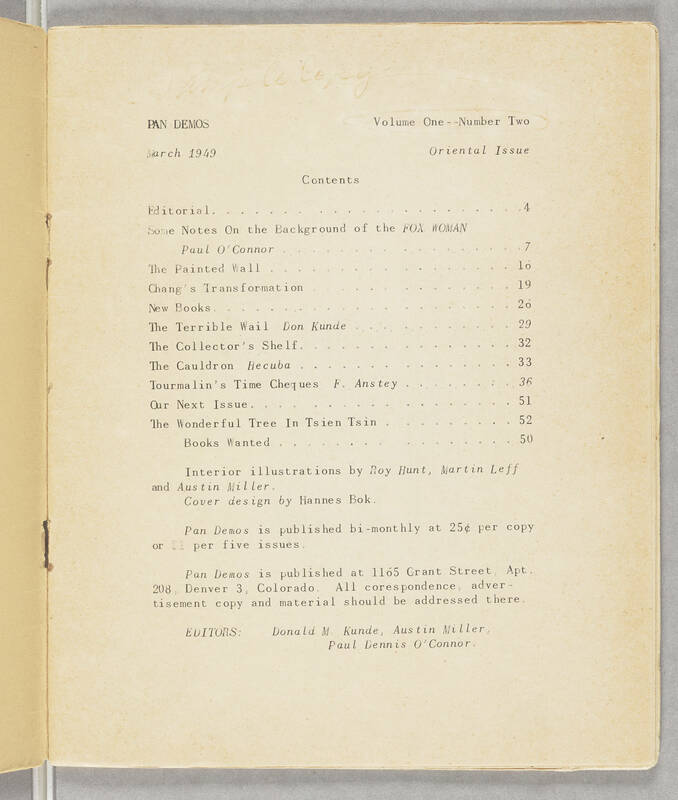 PAN DEMOS Volume One- -Number Two March 1949 Oriental Issue Contents Editorial. . . . .. . . 4 Some Notes On the Background of the FOX WOMAN Paul O'Connor. . . . . . 7 The Painted Wall . . . . . . 16 Chang's Transformation. . . . . 19 New Books. . . . . . . 26 The Terrible Wail Don Kunde . . . . 29 The Collector's Shelf . . . . . 32 The Cauldron Hecuba . . .. 33 Tourmalin's Time Cheques F. Anstey . . . . 36 Our Next Issue .. . . . . . 51 The Wonderful Tree In Tsient Tsin . . . . . . 52 Books Wanted . . . .. . 50 Interior Illustrations by Roy Hunt, Martin Leff and Austin Miller. Cover design by Hannes Bok Pan Demos is published bi-monthly at 25¢ per copy on per five issues. Pan Demos is published at 11o5 Grant Street, Apt. 208, Denver 3, Colorado. All correspondence, advertisement copy and material should be addressed there. EDITORS: Donald M. Kunde, Austin Miller, Paul Dennis O'Connor.